I wanted to liven it up a bit this week so I’m posting some abstract style prints featuring “Street Scenes”. Anyone who follows my work knows I love bright colors and abstract styles in a lot of my prints, so this week I am featuring two where I used a fauvism approach. The first print is Whistler, British Columbia. 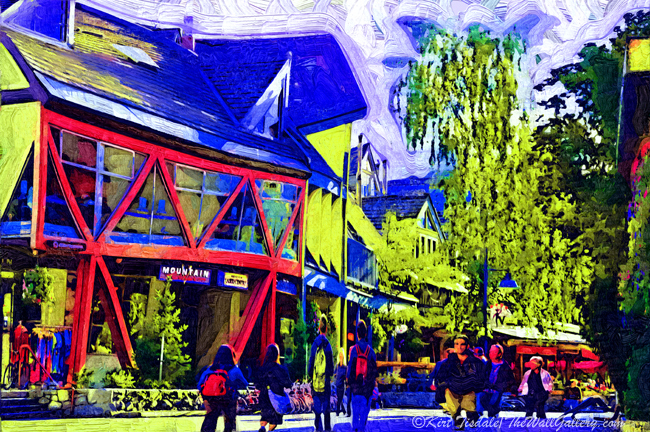 Whistler is so pedestrian friendly and the capture depicts one of the main streets in the village during the “off-season” (non-skiing time of year). The fauvism approach brings surreal colors in abstract type shapes. In this print that really pulls-out and highlights architectural elements with the pedestrians more a secondary feature. The second print does the opposite. 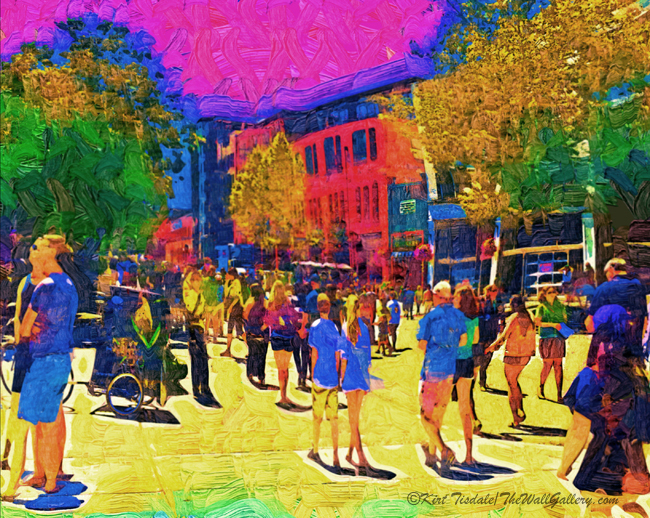 The color and abstract approach highlights the crowded pedestrian traffic in a square near the sports stadiums in lower downtown Seattle. Again, I love the surreal colors making the print a very interesting visual experience. 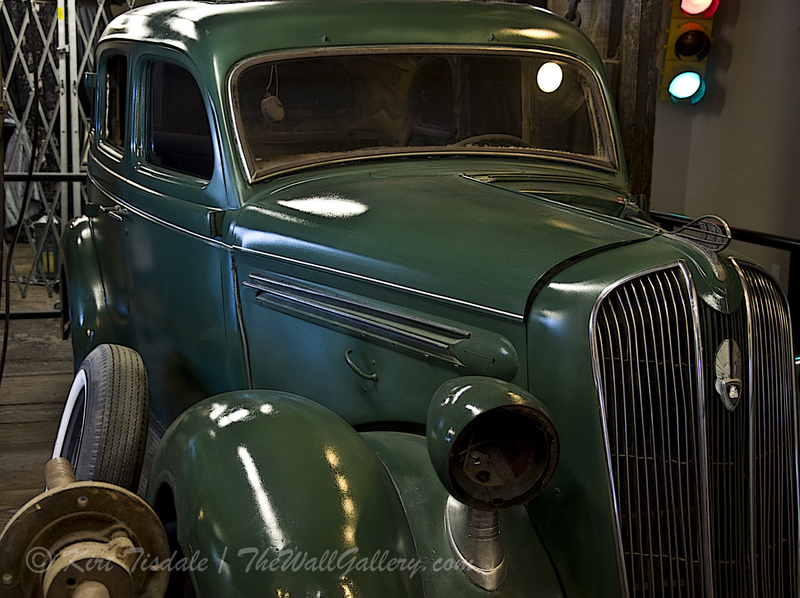 This entry was posted in Abstract Oil, Art Prints and tagged artist kirt tisdale, british columbia, interior design, online art gallery, seattle, street scenes, whistler on March 4, 2019 by Kirt D Tisdale. 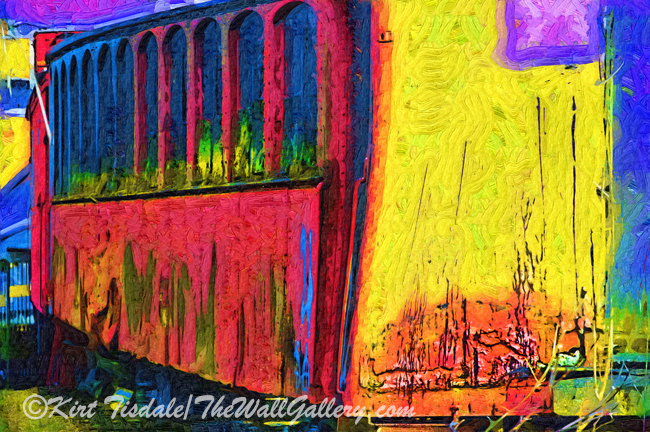 In creating abstract art, I like to take simple subjects and create bright colorful art prints. 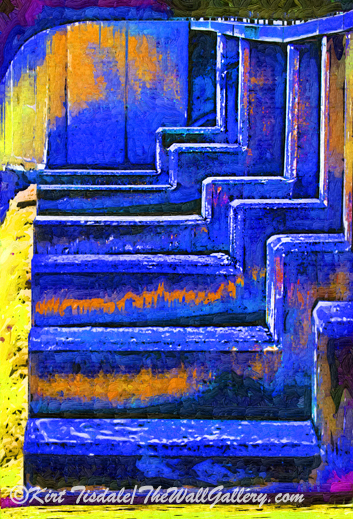 I have attached four art prints that started as simple linear architectural lines. I used a fauvism technique which lends itself to abstract art with bold surreal colors and exaggerated shapes. 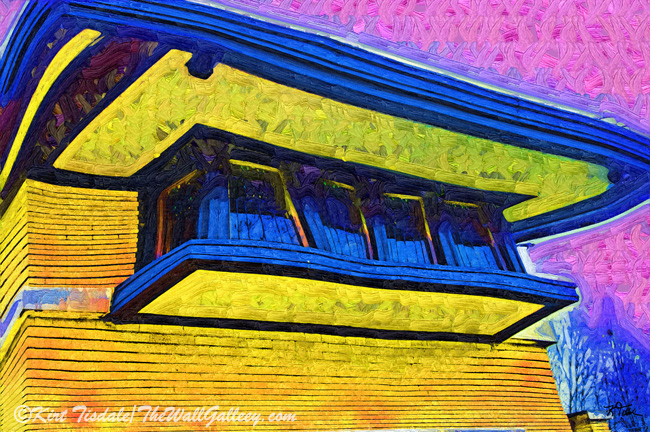 The first print is architectural detail around windows on a Frank Lloyd Wright designed home in Grand Rapids, Michigan. and the final print is an old railroad car. This entry was posted in Abstract Oil, Art Prints and tagged abstract art prints, artist kirt tisdale, interior design, online art gallery on December 15, 2018 by Kirt D Tisdale. As a departure from last weeks black and white photography, this week I want to look at a very colorful sky I created as a backdrop to the Seattle skyline. Using a fauvism technique to create the bright colored sky and abstract look, I have attached two art prints that are just slightly different. In the first print “Space Needle Colorful Sky”, I centered the Space Needle as a focal point with the buildings of downtown part of the background. 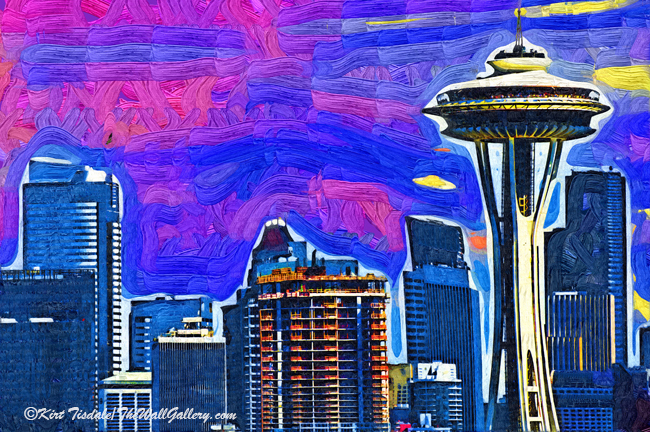 In the second print “Space Needle Fauvism Style”, I put the Space Needle off-center to the right to allow the downtown buildings to become more prominent in the overall look. My initial reaction between the two was the Space Needle centered, but then I was pulled to the Space Needle on the right side for the reasons I stated…..Thoughts? 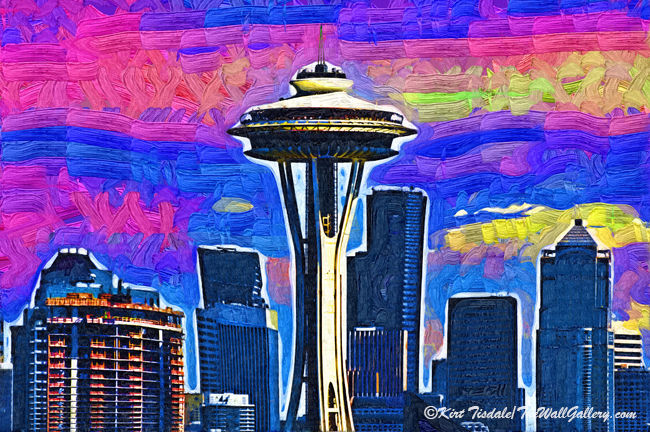 This entry was posted in Abstract Oil, Art Prints and tagged abstract art prints, artist kirt tisdale, online art gallery, seattle, skyline, space needle on December 1, 2018 by Kirt D Tisdale. While helping Mom and Dad introduce our granddaughter to animals at the Los Angeles Zoo last fall, the Flamingos caught my attention. 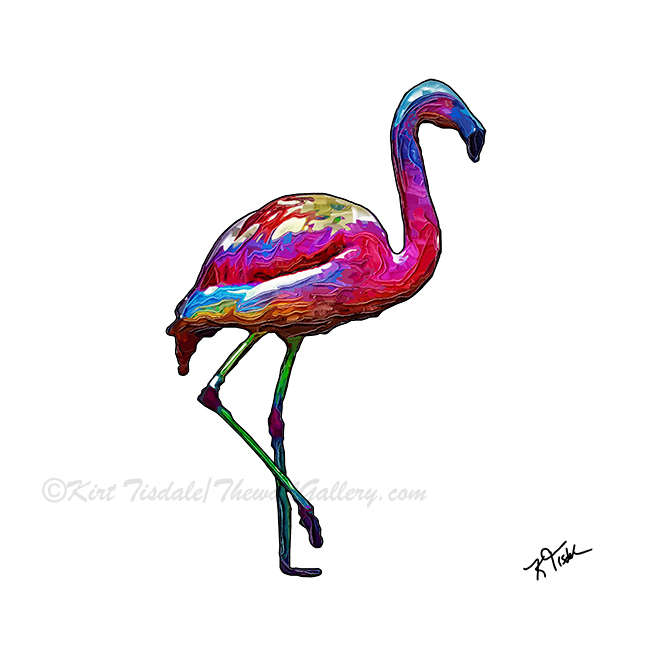 I have always loved the look of Flamingos and their coloring. Looking at some of the images I took from a photo shoot, I visualized them in a unique abstract colorful form. 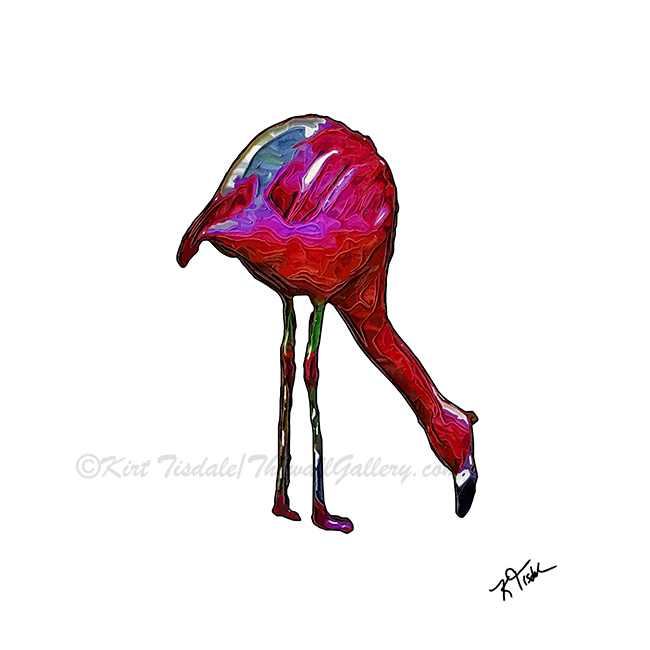 I started by drawing the Flamingos in various stages of walking and feeding. I then filled the forms with a variety of vibrant colors. I took those creations and ran them through a digital painting process that creates strong “impasto style” brush stokes. The attached art prints are the resulting images. 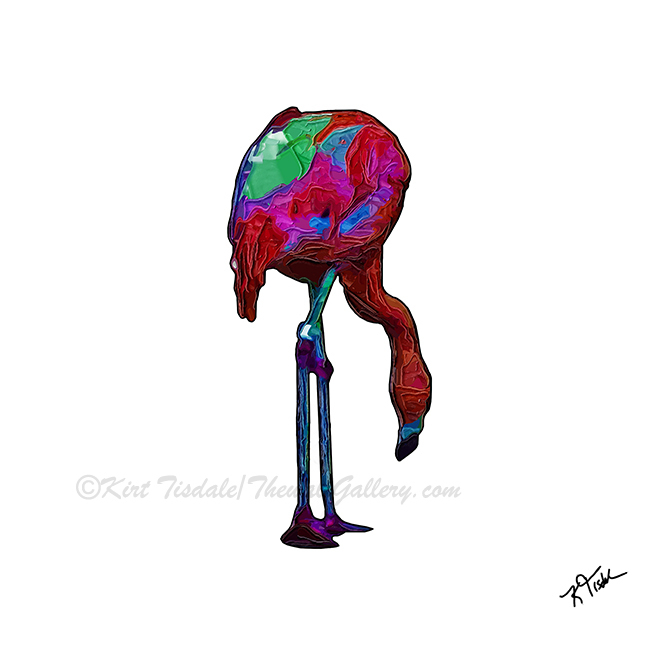 This entry was posted in Abstract Oil, Art Prints and tagged abstract art prints, artist kirt tisdale, contemporary artist, flamingo, interior design, online art gallery, tropical birds on October 5, 2018 by Kirt D Tisdale. 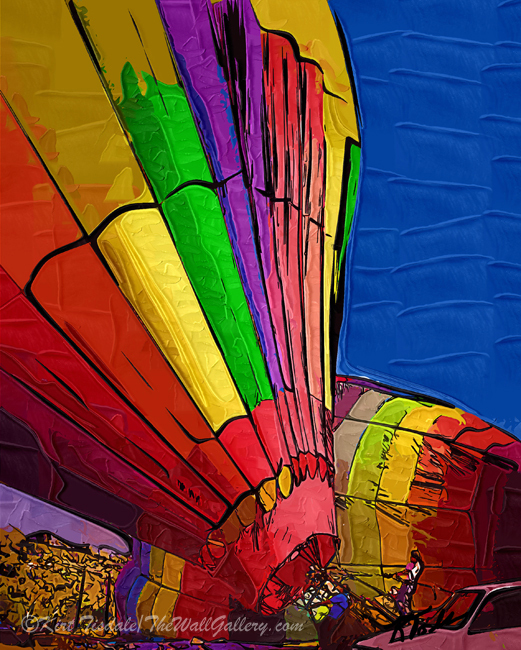 Over the years, I have featured a number of prints from my Hot Air Balloons Gallery. 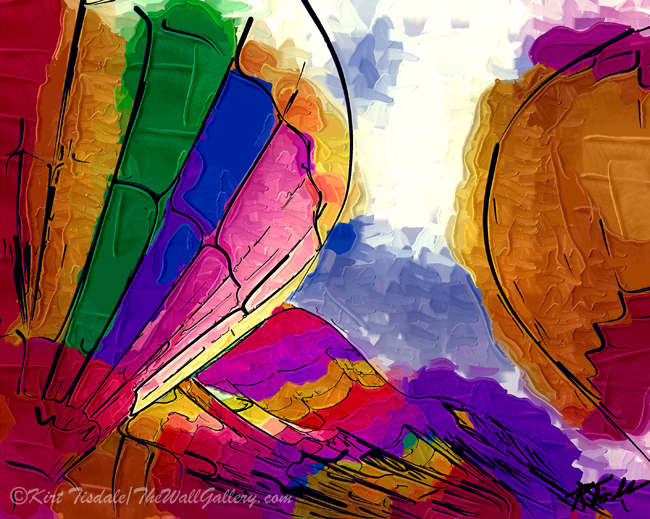 I love hot air balloons and especially love to create prints that are not typical for them. You usually see pictures of the balloons floating in the sky, but I like a different approach. I find the process of preparing these big, bright, beautiful balloons fascinating. Watching them get unpacked, stretched out and then inflated creates an interesting visual experience which I have tried to capture. Over the years I have used a variety of techniques in my presentations. 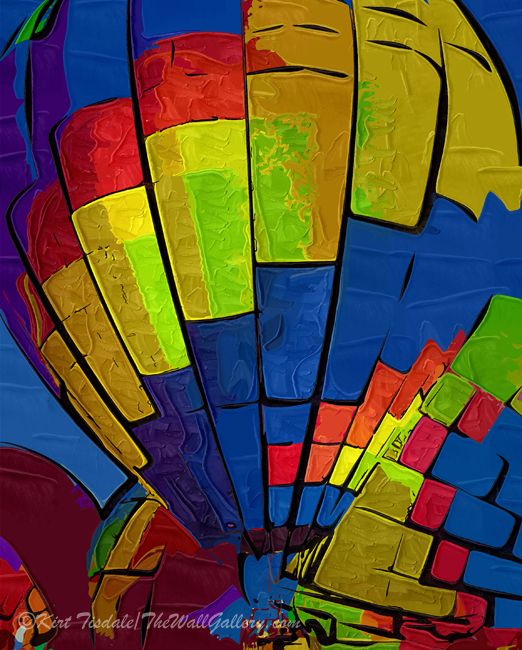 Today, I am using a technique that creates a slightly abstract approach, using bold ink pen strokes to outline the balloons and then filling in with bright colors and strong brush strokes. 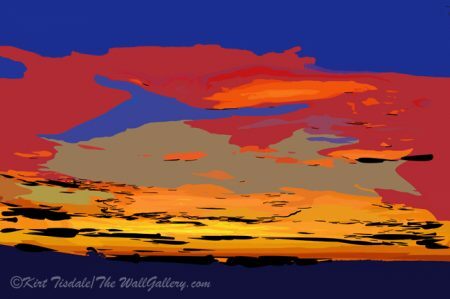 This entry was posted in Abstract Oil, Art Prints and tagged Abstract art, abstract art prints, artist kirt tisdale, contemporary artist, hot air balloons, interior design, online art gallery on August 17, 2018 by Kirt D Tisdale. Anyone who has been following my work, knows I have a fascination with architecture. I did start studying architecture in high school and always thought I would go to some architectural school, etc. etc. etc. Problem was my parents both worked for a private four-year liberal arts college in Iowa which is where all of my siblings and I ended up going (could be the deal on tuition costs for dependents of employees of the college – four of us so you do the math). I ended up with a major in business which to me seemed the most practical. Having said all of that, it was that same school where I was introduced to photography and dark rooms which ultimately led to the things you see here. OK, so that explains my fascination with architecture and why you see a lot of it in my work. Today I wanted to show an interesting mix between that love of architecture and creative artistic presentation. I have done a number of shots of urban high-rises which of course are very linear and rise into the sky in very straight lines. 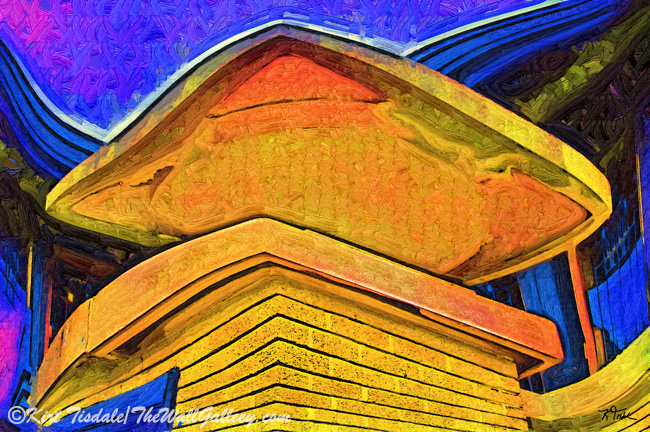 Mixing the fauvism style and technique which presents non-linear and abstract looks to subjects with urban structures results in the attached two art prints. 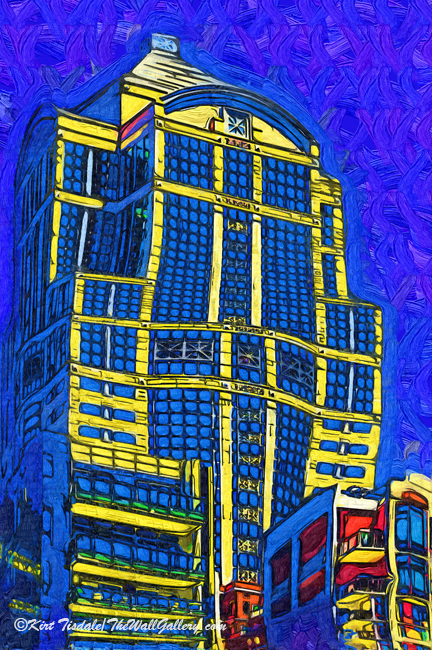 Both prints create an abstract and playful approach to rigid downtown buildings (Seattle in both cases). 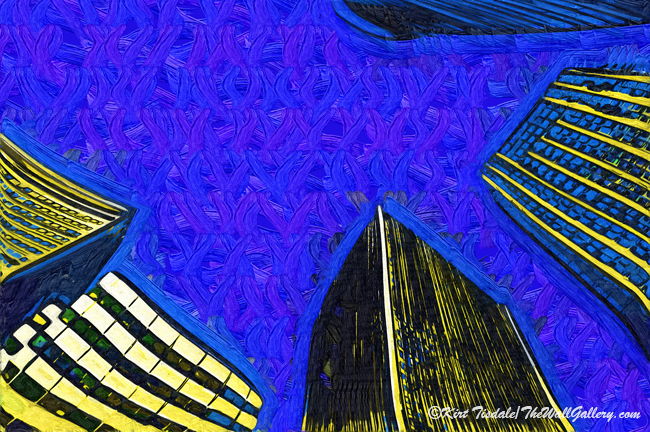 This entry was posted in Abstract Oil and tagged artist kirt tisdale, buildings, cityscapes, high-rises, interior design, online art gallery, seattle, urban buildings on July 20, 2018 by Kirt D Tisdale. 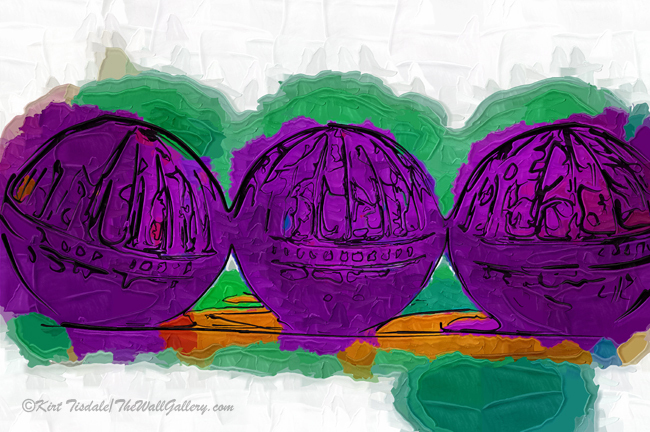 The two art prints I am featuring today are simple items – three decorative balls. These are the typical kind you would find in a large decorative bowl to add a design element to a room. I took these three balls and did my usual photo shoot with various positions and arrangement changes to give me some choices to work with. Narrowing it down to a couple of shots, I then proceeded to do my magic utilizing an abstract technique to create the drawn elements and then started to play with colors. The final piece of the process was to take the resulting colorful “flat” prints and give them a final element of texture which is the impasto technique I employ on a number of my pieces creating large bold brush strokes. 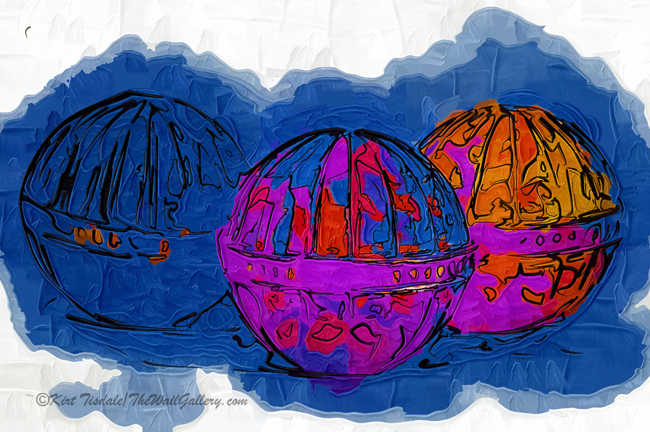 From simple decorative balls to bold and colorful abstract art prints. 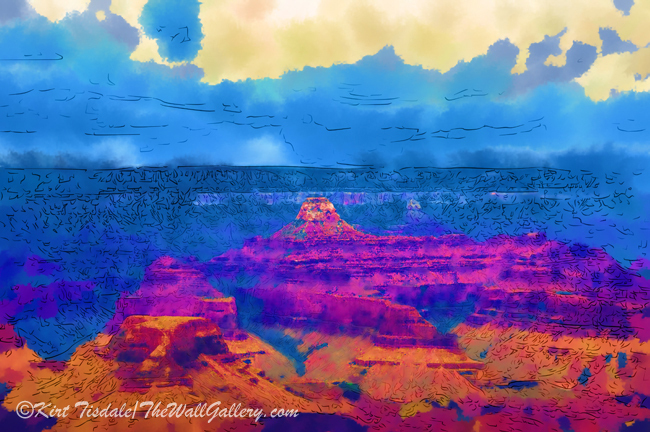 This entry was posted in Abstract Oil and tagged Abstract art, abstract art prints, artist kirt tisdale, contemporary artist, interior design, online art gallery on March 2, 2018 by Kirt D Tisdale.